RD rotary actuators are positioning units designed to fully automate changeovers and adjustment operations in auxiliary axes. They make production processes more flexible and efficient, shorten changeover times, cut costs, reduce downtime and minimize the risks of error and waste material. They are ideally suited for a variety of sectors and applications, and even for replacement of handwheels and knobs in manual adjustment systems without requiring any mechanical modification. They integrate a brushless motor, real multiturn absolute encoder, position and torque closed-loop controller, and Ethernet/ fieldbus interface in the single compact package. Their all-in-one configuration makes integration, installation and set-up easier. RD actuators are available in four models with specific powers and features. RD5 and RD53 is the entry-level model. They have a very compact size and 5 Nm nominal torque. The built-in encoder has a resolution of 18 bits and is mounted on the output shaft. They can also be equipped with a brake for secure holding of the axis. RD1A and RD12A excel in versatility. They are offered in a range of nominal torques from 1.2 to 5 Nm and integrates a 20-bit encoder. They are equipped with jog buttons for calibration purposes and provides a comprehensive range of Ethernet and bus interfaces as well as an RS-232 service port for set-up and diagnostics. These models can also be equipped with a brake. RD4 is the heavy-duty actuator designed for continuous duty. Nominal torques are 10 and 15 Nm and it is equipped with 20-bit encoder and oil-bath gears. RD6 is the latest and the most powerful model. Brushless motor sizes develop a power of 150 W and 250 W (nominal torque: 0.5 Nm and 0.8 Nm), the multiturn encoder has a resolution of 28 bits. Unlike other models, it is equipped with a 14-mm diameter solid shaft. 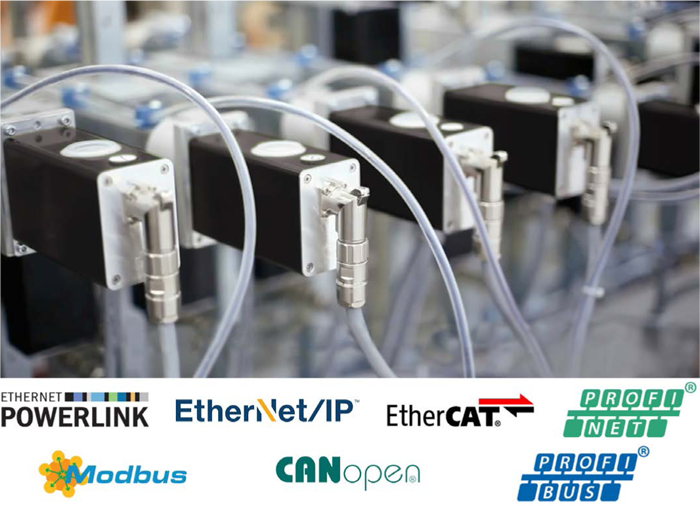 RD actuators communicate through Profinet, EtherNet/IP, EtherCAT and POWERLINK Ethernet-based interfaces, as well as, through CANopen, Profibus and MODBUS RTU conventional fieldbus interfaces, depending on the model. All RDs can be paired with LDT10 HMI touch panel. The match is perfect, especially in multiaxis systems. The touch panel enables full control of all the actuators connected in the network and to store their work parameters into recipes. Pressing one key causes the recipe to be sent to all devices at once, therefore, the entire changeover cycle starts automatically. Among the typical application sectors of RD actuators are changeovers in packaging and bottling lines, adjustment operations in multiaxis systems, filling machines, mould changers, mobile stops, replacement of handwheels and position indicators, material handling equipment, bending machines, tool changers, spindle positioning devices, woodworking industry, plastic and paper industry, stone and metal processing industry.